DAYTON, Ohio — Well, wasn’t that an interesting way to start the party. And now we’ll see if one of the NCAA tournament’s odder streaks will continue another year. It’s about the First Four survivors. One of them always leaves here, jumps on a plane, jets to its first-round site, and promptly pulls off one of the tournament’s early upsets. Happens every year, without exception. Who this time? This First Four gave us Belmont and Fairleigh Dickinson, with the first tournament victories in their history. It gave us North Dakota State, with the man who coached in a T-shirt to honor a neighborhood boy back home with a brain stem tumor. It gave us Arizona State, who hadn’t won an NCAA tournament game in 10 years, presenting the Pac-12 with one more victory already than it had in the entire 2018 tournament — and now sending coach Bobby Hurley to face the Buffalo program he once led. It gave us North Dakota State coach David Richman, explaining his causal look on the sideline, and how his Landon’s Light T-shirt was for a cause “near and dear to me” — supporting an 11-year-old boy who goes to his daughter’s school, and is now in the fight of his life. It gave us a heartbroken LeVelle Moton, after his North Carolina Central team lost, eloquently describing the anguish all but one coach will share before this is done. “My grandmother told me something when I was young and I’ll never forget it. And it’s the realist thing I’ve ever heard in my life. She always told me, the same thing that makes you laugh will make you cry. The exact same thing. And last week we were crying tears of joy, but this week we’re crying tears of sorrow. And not because we didn’t perform our best, but because it’s over. Most of all, it gave us the first four teams to get through tournament fire. “Everybody is pretty much fighting for their lives. It’s almost like a Fortnite Hunger Games type of thing,” Arizona State’s Zylan Cheatham said of these days, and the victors could only hope history now means something. Because if it does, one of them is going to win the next round, too. Someone has done it since the First Four was created in 2011. Every. Single. Year. VCU is the gold standard, using its First Four passage in 2011 as a push start to the Final Four. La Salle, Tennessee and Syracuse all went from here to the Sweet 16, the Orange doing it only last March. 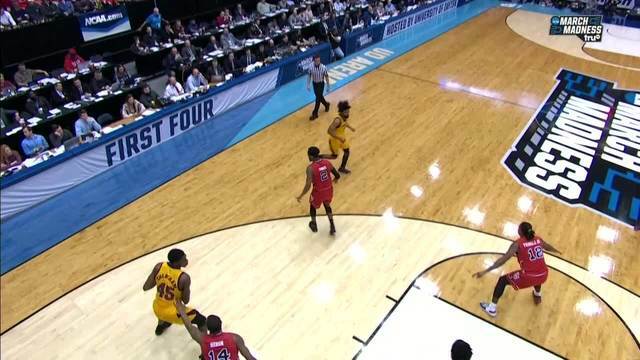 South Florida, Wichita State, Dayton and USC all followed Dayton with a victory. Who’s the best candidate to keep the trend going? Let’s see, North Dakota State now gets Duke and the Zion Williamson Show. Whew boy. “We’re excited to be playing, whoever it is. This is March,” Richman said. Fairleigh Dickinson faces Gonzaga. The 16-1 seed match grew more hopeful last March as fast as you could say UMBC 74, Virginia 54. Psychologically for 16 seeds, there is a vast difference between a 1-135 record and 0-136. Still, what are the odds? Arizona State and Hurley will have their hands full with Buffalo, a veteran team that shocked Arizona last March and has looked ready all season for more. Nate Oats has kept the momentum rolling there, since he moved up from assistant to head coach in 2015, replacing the man who left for Arizona State. Bobby Hurley. "I haven't really had time to think about how I'm going to feel on Friday," Hurley said Wednesday night, after the Sun Devils got through a messy 74-65 win over St. John’s Wednesday that — after halftime — had 40 free throws and as many turnovers as field goals. "But Nate and I speak, and we both agreed that we're really good friends, and we both helped each other tremendously in our careers, but that's probably not going to matter a whole lot on Friday." That leaves Belmont, a trendy upset pick against Maryland in Jacksonville. The Terrapins look a little vulnerable; 6-7 their last 13 games, and a quick out in the Big Ten tournament. All in all, a proper start for the NCAA tournament. And now, the dance floor really gets crowded.